The following is a guest post by Nick Berens, a senior front-end developer at wisnet.com. Nick and his team have been building websites through custom style guides for years. Over those years, Nick has been building and evolving a tool to help with this process. I'll let Nick explain both the philosophy and the tool. I bet you’ve heard about style guides. Perhaps you've heard about style guide driven development (SDD)? I'm a front end developer at wisnet.com, an agency specialising in PHP and WordPress development. This is a brief intro into style guides and our team’s experience with style guide driven development. Over last 2 years I have been practicing SDD with a tool I wrote called Atomic Docs, a front-end style guide generator and Sass partial manager. I'd like to introduce Atomic Docs and some of it’s features that have made SDD a simple and essential part of our workflow. There are two types of style guides we work with at wisnet. 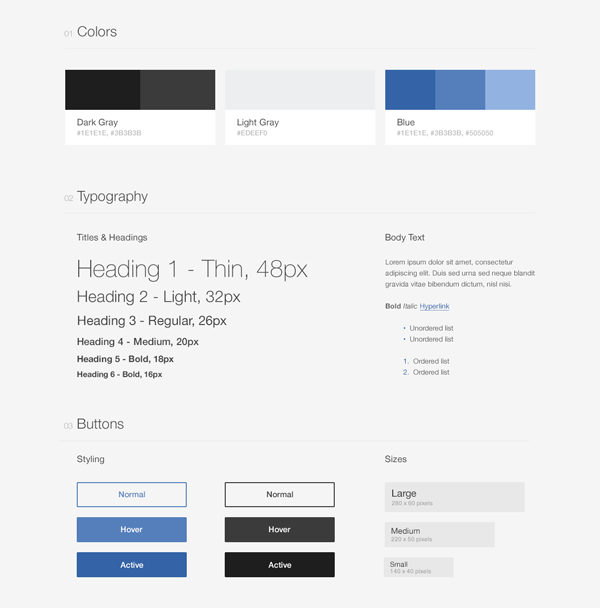 A static design style guide and a more dynamic front end style guide. Our design style guides are static Photoshop (PSD) files cataloging a project's global design elements. They document a project’s colors, fonts, headings, button states, link states, lists etc. Our front-end style guide, which is generated by Atomic Docs, provides documentation for the code associated with the front-end components of a project. Think of the documentation site for Bootstrap. It provides notes and markup examples for each of its components making it easy to reference, understand and use each component. A living style guide is a system that allows the components within the style guide to remain in sync with the components in the site, without having to update the code in both places! For large projects, a living style guide is the key for a successful system. To help illustrate, I’ll briefly outline our process at wisnet. At wisnet, our style guide process begins with our designers. Every project they hand off comes with two deliverables. A traditional PSD comp of the full page layouts as well as a design style guide documenting the project's global styles. Once complete, the PSD comp and design style guide are handed off to a front end developer. The first thing I do is open up Atomic Docs and start documenting the global design elements as defined in the design style guide. After adding the global design elements, I open up the PSD comp which has the full design. Since I use Brad Frost’s Atomic Design principles, this is when I start analyzing the design and deciding what design elements will come together to compose the design’s Atoms, Molecules, Organisms, Templates and Pages. Organizing and managing components in this fashion is where Atomic Docs is really helpful. Once all of the components are built, categorized and documented in Atomic Docs, it is simply a matter using the components like lego blocks to build out the pages and views. If the project is an application, I will hand off the static views along with the Atomic Docs style guide. With the style guide as a reference, it is easy for the backend developers to make adjustments to the front end as needed without having to interrupt their workflow by handing it back to a front end dev. As you might suspect, the development process is never quite this linear (there can still be lots of back and forth between teams), but the use of style guides provides a common design language which enforces design and code consistency throughout the lifespan of a project. What are the advantages of SDD? Stephen Hay’s quote is at the heart of SDD. We’re no longer building a button to be red when it’s in the context of a sidebar. We’re now just building a red button that’s going to be red whether it’s in a sidebar, footer or header. When you build without context, the side effect is a front-end codebase that’s far more scalable, modular, and maintainable. Style guides have encouraged our designers and junior developers to build pages and views quickly without having a deep understanding of HTML/CSS/JS. And since each component is isolated, it makes it easier to understand the code that created it. No matter how big or small, every project our team completes has full documentation of its front end design system. This makes every project far more maintainable. It is especially useful for the organizations we’ve worked with that have internal development teams. It has made it a lot easier for these groups to make changes and scale their projects and has been valuable. Since the style guide contains the project’s color and font definitions along with logos and other graphic assets, it can be viewed as the design source of truth. Atomic Docs has two primary features. Being able to break up my CSS into small partial files is one of my favorite Sass features. Managing all of these partial files is not. 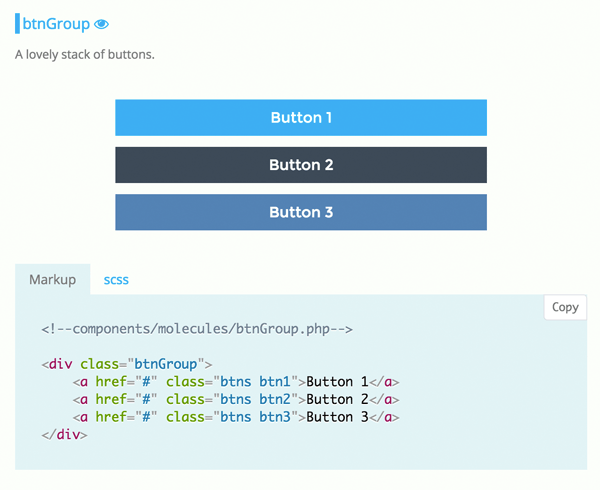 Here’s a screenshot of a molecules category and root `molecules.scss` file. Creating this structure is wonderful for organization and overall developer sanity. But as the project grows, creating and managing the partial files becomes a pain point in my workflow. Atomic Docs provides a GUI for handling the creation and management of these partial files along with writing the @import my-component string to the corresponding root `.scss` file. Through this interface you can also rename files, move them to different categories, and delete them. You might be thinking that I’m super lazy and creating partial files isn’t really that big of a deal, but it’s truly my favorite part of Atomic Docs. Perhaps the biggest advantage to using Atomic Docs is how easy it is to get up and running with the style guide. Not opinionated about the preprocessor you use. You can use Grunt, Gulp, Code Kit, Prepros or whatever. This isn’t meant to diminish the projects that are more complex in nature. That complexity allows them to have some really advanced features. I just wanted a solution that was a little simpler that our team could get up and running with little friction. 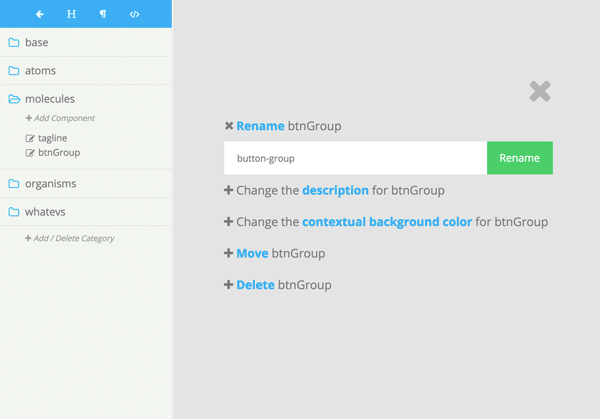 Atomic Docs can be configured as a living style guide. If the file atomic-head.php is in the root of your project Atomic docs will include it in it’s <head> section. So if you were working with a simple PHP app for example, in atomic-head.php you could include <?php require_once(my-path/db.php); ?> to connect the database to Atomic Docs as well as <?php require_once(my-path/functions.php); ?> to share your app’s functions. Now you can work with your app's data and functions in the components you create. Then it’s just a matter of including <?php include(components/modules/my-component.php); ?> in your application. Since this component is already being included in Atomic Docs every change you make in `components/modules/my-component.php` will be reflected in both the style guide and everywhere you include the component in your application. Atomic Docs is great for our workflow and our development stack at wisnet. If it is not a fit for you there are many great solutions. Styleguides.io has a wonderful collection of articles, books, tools and talks to help you make the right decision for you and your team. For a more in-depth look at style guides, checkout this great article on Medium. After two years, style guide driven development has proven to be a valuable addition to our workflow at wisnet. Whether you’re using Atomic Docs or any of the other great tools out there, I think you’ll find that SDD will help provide design consistency and scalability to all of your projects. This really is a great tool that has helped me think about the code I write and how it can function on its own in any context instead of coding elements with a specific purpose. The little extra bit of time creating atoms and molecules speeds up your development down the stretch. Having a visual interface for looking at all of your elements on their own is also great (especially for colors and buttons). Thanks for being awesome Nick! How do you create a front end without a back end? When you say “I will hand off the static views … backend developers to make adjustments to the front end”, are your back end developers writing the front end ajax and form submissions? It depends on the project. The line between front-end and backend gets pretty blurry. It’s such a good idea and convenience for your team to have a living style guide. Are there any other solutions similar to this one? Just downloaded Atomic Docs, but can’t seem to make it work on a fresh copy of Mamp. Maybe some permissions on the folders where it needs to write new files and modify the existing? Sorry to hear it You’re welcome to post your issue on GitHub. Just installed Mamp on my Mac, and was on my way to download Atomic Docs, what issues did you encounter and did get resolved? I just installed mamp on my macbook and Atomic Docs is working fine on my end. Just tried this package in conjunction with WordPress, thanks to the online doc sub-section you provide. By the way, I wonder if the “JS” folder is a clue for an upcoming JS-Snippet feature ? If it happens, I must admit I wouldn’t know how to apply such design principles to a JS architecture. (include() / @import equiv.) maybe with modules loaders à la Browserify. My knowledge fall short in this area. 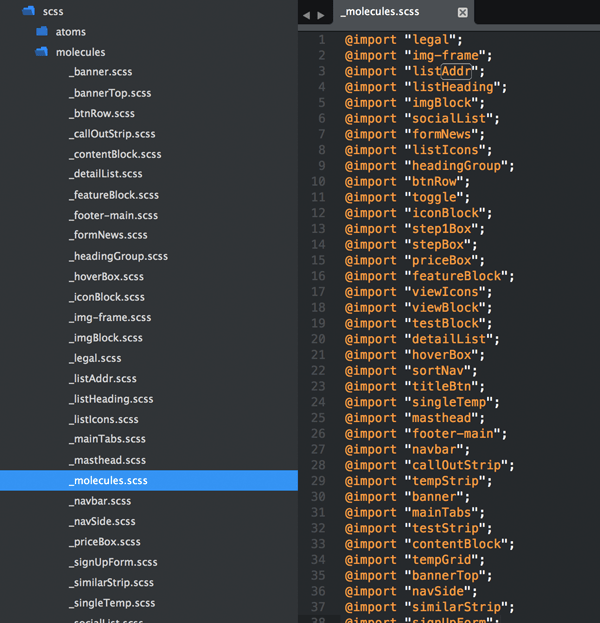 On an other note I would love to be able to set working directories for AtomicsDocs. I use to not clutter my theme folder with sources files, so being able to put atomics-docs anywhere in a WordPress environnement would be a great benefit IMHO. The JS folder is there for convenience at the moment. But yes, I’ve been thinking about adding the option to create a js file when adding a new component. The tabs documenting the code would then be “Markup | Scss | Js”. Pretty much any build tool (grunt, gulp, webpack, etc…) can handle the concatenation of the Js partials. I use gulp-concat for this. We are also currently refactoring the code to make it so you can set the working directory. Thanks for the feedback! Really cool :) Can’t wait ! I’m thinking about a use case for this : common “design base” for WP multi-sites / themes (while retaining specificities) by putting in a parent folder of themes. Regarding JS, I thought of using classical -serialized- concatenation workflow like you suggest but I fear it will not be as powerful as the nesting behavior of PHP / SCSS. Pardon me for asking without diving in further into atomicdocs.io, but what are the differences between this and Pattern Lab? On a quick glance I do appreciate the more approachable UI, however would you be able to speak to some of the other differences? Thank you! Hi Brian, I really don’t have any experience with Pattern Lab other than browsing the documentation. I’d be interested in hearing your thoughts if you try out both though.